Hi, I’m Melissa, the “Lissy” behind Lissylane (and always the one behind the camera, so I apologise for the daggy selfie). Originally I started Lissylane to inform brides of their options for alternatives to fresh flowers for their wedding bouquet. I created a custom felt and button flower bouquet for my own wedding on 1st March 2009. Many years down the track and we have expanded our family to 5! We have three beautiful little boys, Addison (5), Preston (3) and Jasper (1). My time has now become very limited and mummy life certainly takes priority. Although I loved helping brides to make their day special through felt flowers, I no longer have the time to create these custom bouquets. I however still stand by my belief for creating a unique and special wedding day and therefore Lissylane is a fantastic resource to help plan your big day. Lissylane has a comprehensive, free wedding guide to help brides and grooms plan their very special day and plan it their way! When planning a wedding (I think this is only something that other brides will know) there is so much to think about, it really can become an overwhelming process. Lissylane is designed to try and eliminate some of the stress related to planning your wedding while giving you some wonderful options you might not have previously considered. I am a firm believer that a wedding should be a reflection of the bride and groom, and that there really are no rights and wrongs when planning a wedding. There really are no must haves for a wedding and I think that this is something that too many brides get caught up in. We’ve been living on the Gold Coast in Queensland, Australia for about 10 years now and are both originally from Toowoomba. I have always been creative and right from the word go I was making something, it didn’t matter what I had to work with, be it pipe-cleaners to rocks or just plain butchers paper and pencils, I would occupy my time coming up with something new! During my school years I was naturally into art and loved every minute of it. My art saw me winning different competitions and awards but after school it was actually radio that I turned my hand to (thankfully, as this is how I met my husband). After a few years passed of not knowing exactly “what I wanted to do when I grew up”, I finally took the plunge into Interior Design studying and working in admin and accounts. I’m a qualified interior decorator with a passion for all things craft and design. Just when I thought I had it all sorted out life changed again! 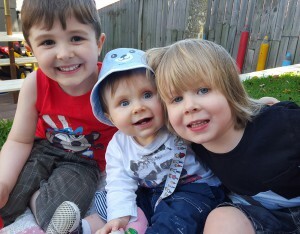 I’m now a full time mummy to three little boys, self taught graphic and web designer, house wife and blogger. I think it is probably one of the hardest things I’ve ever done, but the most rewarding. It’s a juggling act but life would be boring if I didn’t challenge myself. My boys are my world (yes, three boys, no I’m not having any more children, yes I did want a girl, yes I did try for one, no it doesn’t work like that, yes I do have my hands full! OK that’s the questions answered that I get asked when I step out of my house with the kids). 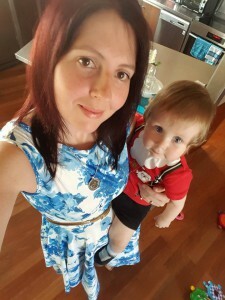 During my pregnancy I started a blog as not only a record of my pregnancy but to share with friends, family and the world. I also have written information to help pregnant women week by week during pregnancy as I found the current information on the web not up to par. You can check it out at www.pregnancybabychild.com. There’s also recipes, patterns and free party printables. It’s an ever expanding website when I just get a moment. My most recent project and source of income for our little family is web design (Vesari is our business). I’ve also written and illustrated a children’s book which I plan on launching on my blog as an e-flipbook in the not so distant future. I’ve got so many hobbies that all revolve around being creative plus it doesn’t help that I’m slightly addicted to Pinterest! I’m in the process of making a Lissylane Pinterest account so that brides can follow the page and gain inspiration from the pins. Hopefully I’ll be able to continue to add to the boards every so often, but for now you will find many beautiful wedding dresses, bridesmaids dresses, accessories, cakes and colour schemes. I will add boards as I grow the account. For now feel free to pin away and follow the account, sharing the love with other brides planning their big day.